Angus Buchanan (1886-1954), Explorer, photographer and filmmaker. Sitter in 2 portraits. T.A. Glover (active 1920s), Explorer, photographer and cameraman. Artist of 2 portraits. The photographer who took the above photograph was most likely to be Mr. T.A. 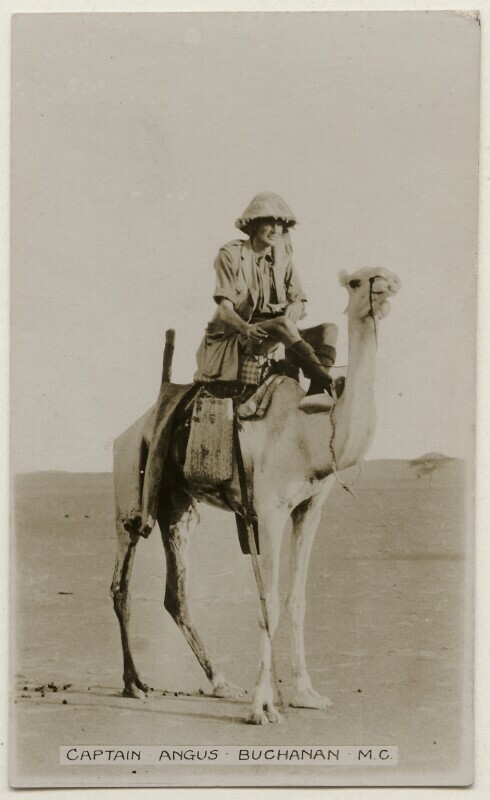 Glover who was a member of an expedition led by Captain Angus Buchanan in 1922 to cross The Great Sahara Desert. So the photograph must have been taken at the beginning of the expedition. The journey took 16 months so was finally completed in 1923 at Algiers. Captain Angus’s Camel was called Fern N Gashi and was the only surviving camel of the whole expedition. He died two hours after completing the journey which was 3,500 miles long.